Amoco Rainey Soil Remediation - J.H. Maxymillian, Inc. 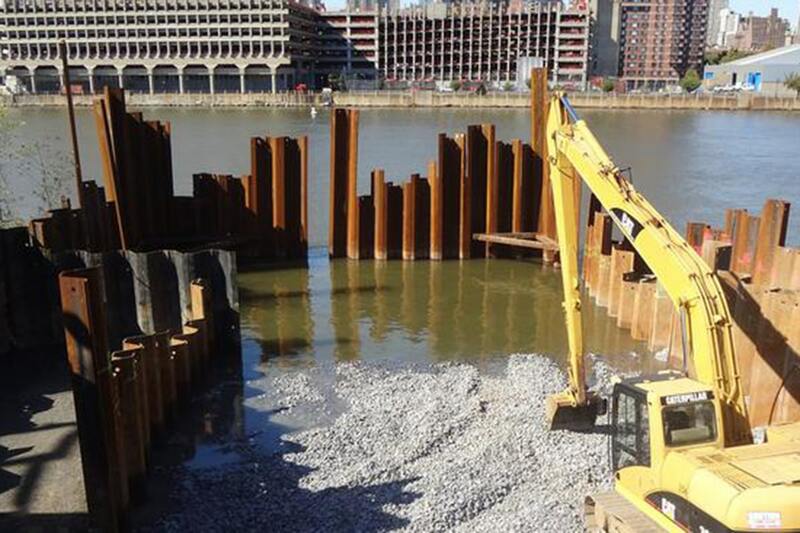 Located in an environmentally sensitive area, Maxymillian constructed a containment cell on this 2.15 acre industrial site to remove 4,200 cubic yards of petroleum-contaminated soil and sediment along 100 LF of the East River in New York. Maxymillian drove 3,800 SF of permanent sheeting and 8,000 SF of temporary sheeting with 560 LF of wales and struts. A barge-mounted crane with a vibratory hammer was used for the waterway, while the Upland Area required an ABI – Low Momentum Vibratory Hammer due to a major sewer line 1 foot away. Maxymillian performed mechanical dredging within the East River using a barge-mounted crane with a conventional dredge bucket. Dredged and excavated soil, sediment and debris were managed and blended as needed before off-site disposal. The excavation area was backfilled and capped using sand, stone and rip rap to meet the criteria of the designed cap.